Will a Tesla Stock Split Ever Happen? The revolutionary automaker has never made such a move, but is it coming soon? The auto industry largely features well-established giants, and the opportunities for new entrants have been few and far between. 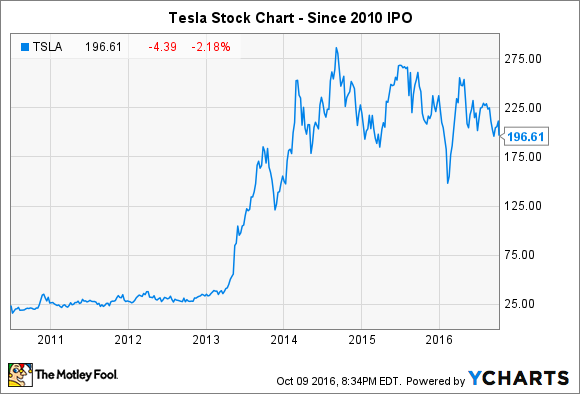 Yet Tesla Motors (NASDAQ:TSLA) has thus far succeeded where many others have failed, and after coming public at $17 per share in 2010, the stock has climbed well into the triple digits. Yet for all its accomplishments, one thing that Tesla hasn't done is to split its stock. Below, we'll look more closely at Tesla's history to see what the likelihood is that a stock split could happen in the near future. As you can see below, Tesla stock has delivered substantial returns to investors who've stuck with the company for the long haul. Since 2010, shares have climbed more than tenfold, and early investors have earned average annual returns in excess of 40% over that time frame. The chart shows that Tesla has had plenty of opportunity to do a stock split if it wanted to, with the stock price having climbed nearly to $300 per share at some points in 2014. Yet with a stock split not coming then, some investors wonder if there's any better reason to expect a split to happen now. Tesla has inspired speculation over when it might split its stock ever since the share price started climbing at an accelerated rate in 2013. The big move upward coincided with Tesla and CEO Elon Musk making good on a promise that they had made soon after the company went public, successfully building and delivering 20,000 Model S vehicles during 2013. The big ramp-up in delivery figures began in the first quarter of 2013, doubling from the previous quarter and approaching the 5,000 mark. Subsequent estimates put Tesla Model S production for 2014 at even higher figures, silencing skeptics and sending the stock on a steep upward trajectory. Once the stock hit $100 per share in late 2013, stock split discussions among investors started popping up. Even more discussions occurred when the stock moved above $200 shortly thereafter, where even a 2-for-1 split would have still left Tesla shares trading in the triple digits. Yet despite widespread chatter among investors, Tesla never made a move, and a search of Tesla conference calls didn't turn up any mention of "stock split" or similar phrases. In past decades, many companies sought to avoid triple-digit stock prices, figuring that an expensive stock was harder to trade and would discourage investment. More recently, though, the advent of online brokers that make trading in less than 100-share increments much easier to accomplish made stock splits less necessary, and many cutting-edge companies that have seen their share prices rise substantially have chosen not to split their shares. With high stock prices having almost become a status symbol of success, investors haven't felt any need to insist upon stock splits, even for companies like Tesla that has had shares climb precipitously. Moreover, right now, Tesla Motors has a lot of other things on its mind. The biggest is its planned acquisition of SolarCity (NASDAQ:SCTY.DL), which is expected to go up for a shareholder vote among Tesla investors in the very near future. Despite being in the apparently unrelated business of residential solar electric systems, SolarCity is a key part of Musk's overall vision for Tesla. For a decade, Tesla's master plan has involved creating increasing demand for electric vehicles, starting out at the high-end luxury level and gradually working downward toward building more affordable mass-production vehicles. In order to fulfill the goal of moving away from fossil fuels, Musk believes that the energy for recharging electric vehicles should come from solar power. Acquiring SolarCity, therefore, would allow Tesla to offer a more all-encompassing package to interested car buyers that fully realizes Musk's vision. Yet some investors are skeptical about the proposed merger, arguing that Tesla is essentially bailing out its weaker solar-energy specialist sibling. Until the fate of the transaction is known, it will be hard for Tesla stock to make much progress in climbing further from its early 2016 declines to regain its past heights. It's conceivable that Tesla could split in the future, but there doesn't appear to be any pressing reason to do so at this time. If Tesla follows the same strategy that several other stocks have used in waiting until the share price had climbed far enough to make a formerly rare 7-for-1 stock split viable, then the automaker would have to see its shares more than triple. That could take a while, and there would still be no guarantee that Musk wouldn't simply want to watch the share price climb as high as it could possibly go.